Want To Enhance Your Return? Home > Blog > Want To Enhance Your Return? Today I received an email from a client who is following a low risk wealth creation strategy based on regular investment of surplus income into a diversified, low cost fund. His email came at a good time as it prompted me to write this short blog. He asked what many might be wondering at the moment with the current economic news and rumors. Was there a strategy to better time his investment deposits? Some professional Fund Managers use all the experience, time, information and money (yours) at their disposal trying to do just this but usually fail to provide returns above the index over the medium to long term. Some DIY "investors" have a go too, often damaging their personal wealth in the process, but why is this? In the absense of information that is not already known (and legal in nature!) or an expertise that is significantly better than the professionals who do this for a living, a DIY investors best hope is to sell at the time when they feel most optimistic (greedy) and buy when they feel the most dispondent (fearful), which is the oposite of what they feel like doing. Successful investing is about having a financial roadmap that provides you certainty for the future. 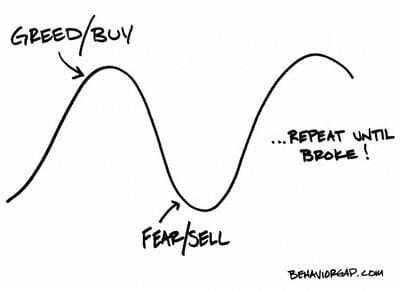 The good financial behaviours that result from this means market cycles become your friend and those who are trying to time the market unsuccessfully, will actually enhance your return outcome!